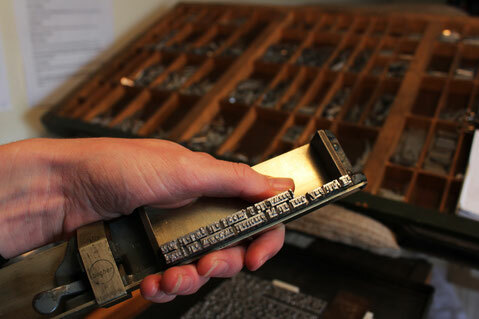 Before offset and digital printing, the text on a page of printed material had to be composed by hand. 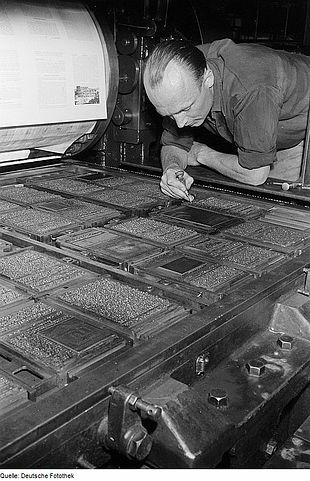 Later, this was done with a keypad and a machine; but right up until the 1800s there were teams of specialised craftspeople called ‘compositors’. Their job was to pick up each individual letter and punctuation mark; position it, with spacing, to form a word and fill out a line; and in this way construct a sentence, a paragraph—and, finally, a whole document, newspaper or book. When you think about those huge broadsheet newspapers they had back in the day, all in 6 point font, you’ll see this was no small task! 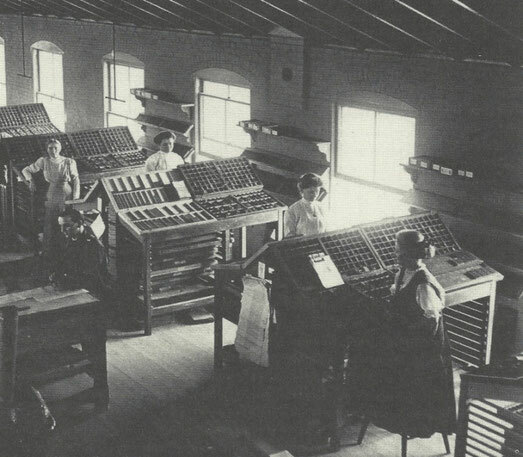 Compositors at work for The Brethren Publishing Co, typesetting for ‘The Wellington Enterprise’ in Ohio in the late nineteenth century. This is my home compositor’s rig, made up of my dining table, an old pine box, and a recommissioned ergonomic chair with my California Job Case on top—all set up to form a work stand. 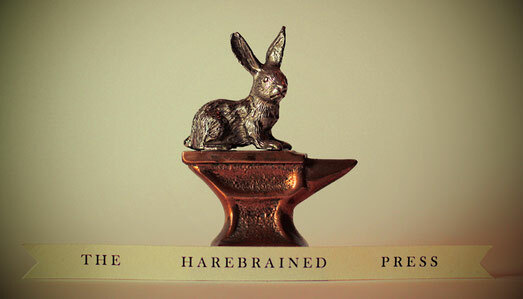 Aside from the type itself (the collective name for the individual characters, or ‘sorts’), compositors use a few other important tools to do their work. The first is the ‘type case’: the compartmentalised tray in which the type is stored—and from which you can work. The one I’m using for my project is called a ‘California Job Case’, popular because it holds everything you need to compose your sentences, including uppercase, lower case, punctuation, numerals, ligatures and spacing material. It’s interesting to note that the terms ‘uppercase’ and ‘lowercase’ come from the printing world: from these type cases and the positions in which they were stored. 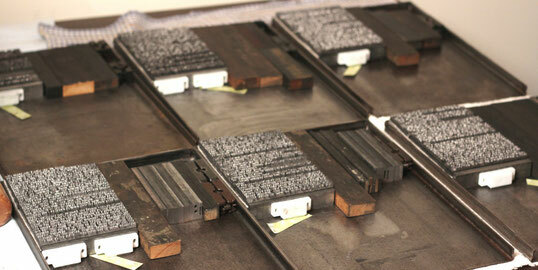 Another tool that’s important when typesetting is the ‘composing stick’. This is a little receptacle set to the lines’ length that allows me to arrange the sentence in my hand. Here are six pages, which are almost complete, set and locked (haphazardly!) into the galley. All I need to add now are my headers and folios (page numbers). 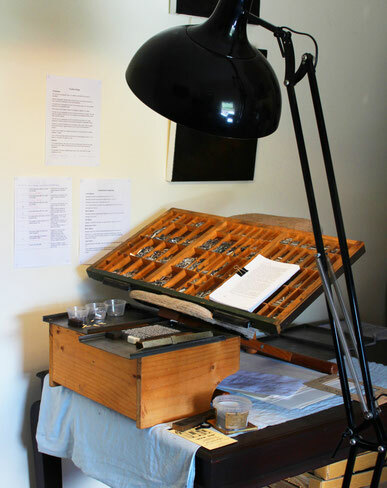 When I’ve finished composing a few lines, I lift them out (with care) and place them on a metal tray, called a ‘galley’. The galley is a little delivery platform for the new-born page; on it, the page can be locked into place so that the type doesn’t get all jumbled—or, as they say in the industry, so that it doesn’t get made into ‘printers’ pie’! It can be transported from one place to the next, or slipped into a cabinet called a galley rack and stored until it’s needed. A classic image of a printer: By Deutsche Fotothek‎, CC BY-SA 3.0 de, commons.wikimedia.org/w/index.php?curid=6543777 ‘Letterpress Printing’, Wikipedia.